We were in Mount Austin for the other matter and decided to have lunch here as well. 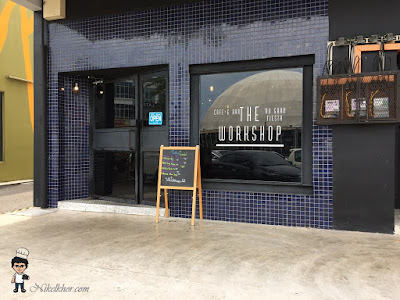 Mount Austin has been developing into another food paradise and a hot spot for youngster in Johor Bahru, mainly because of the increasing population in the vicinity. Mount Austin is especially crowded and happening during the weekends and after works. We visited The Workshop during the day time, which is less crowded and parking lots are easily found. 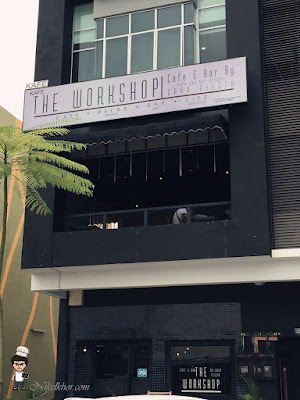 The Workshop, is one of restaurants operated by Gran Fiesta. The whole building is painted in black, modern yet adventurous design. Its interior, as it is named, reflects industrially-inspired elements, by featuring exposed bulb lighting and playful wall illustrations. The Workshop is also a hybrid of cafe and bar, suits everybody's needs from morning tea to night drinks. 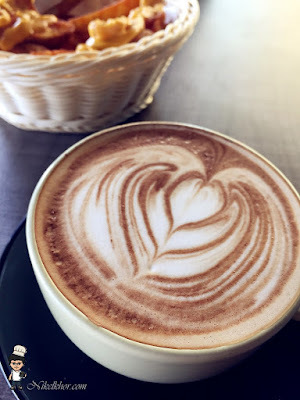 We ordered a Mocha, which is on the average and nothing to shout about. But, as mentioned earlier, this is a place to suit everybody's needs, so the wide variety of drinks and foods is a key point to gather a bunch of friends who have different craving. As we were too hungry, we had the wedges with cheese. 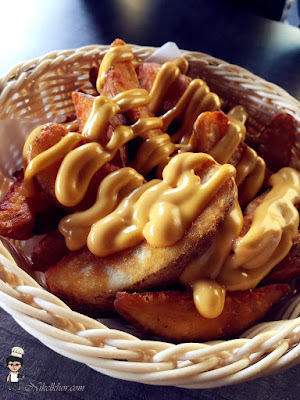 We have unavoidably compared it with the cheezy wedges in KFC, but we are of the view that this version is equally good with the very creamy cheese sauce. It is also a very good and handy bite to pair with beer. 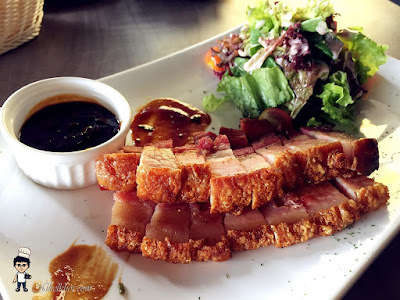 This is the dish that we didn't expect it to serve like Chinese's "siew york", we thought it will be in the form of pork chop to feed my hungry stomach. We honestly didn't know that it is actually a beer food. Haha, no wonder the waitress asked us if we want the plain pork belly version or the other one with spaghetti. Ok, I am hungry enough to wallop everything and definitely includes this "siew york". Undeniably, this is very savoury to go with beer, but eating it alone in the afternoon as late lunch, I found it a bit overly salty. 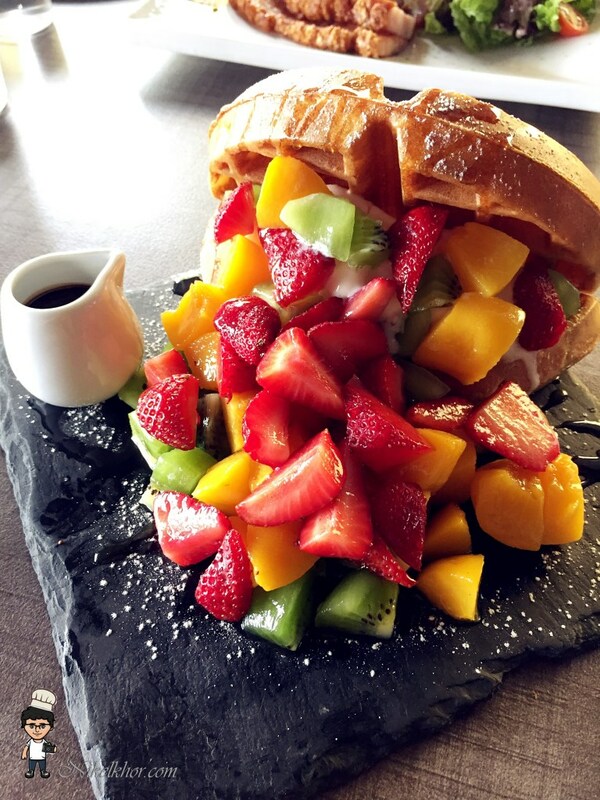 Warm waffle with strawberry, kiwi, peach & vanilla ice cream. This is one of the signature desserts and as it is named, it is presented in the traffic light colours. 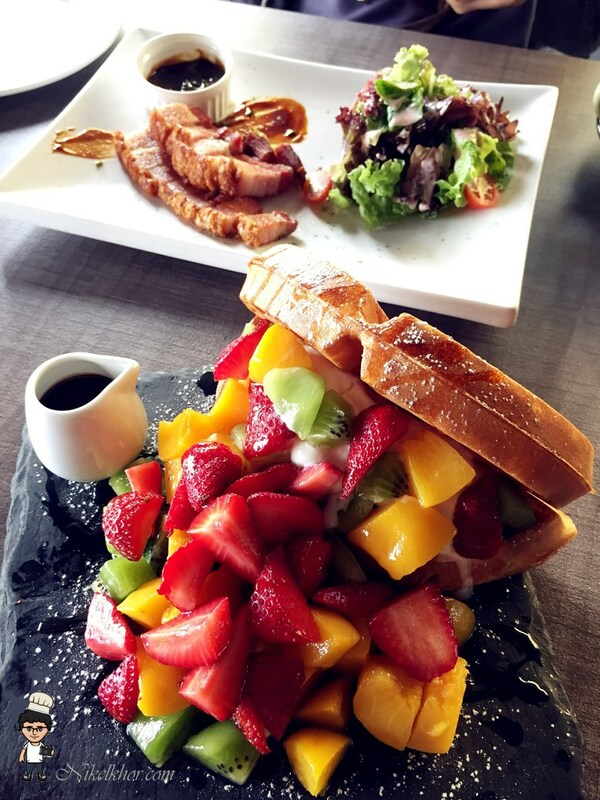 Very delightful looking at the abundant fresh fruits and we almost overlook the ice-cream sandwiched by the waffle. The waffle was well done too, crispy at the outside and soft at the inside. The batter was just nice and not too sweet, allow the fresh fruits to fully express its natural sweetness.